Shopping! The Musical is an original revue of comedy songs and sketches about everyone's second-favorite (maybe favorite) pastime. The fast-paced show targets all kinds of stores, customers and merchants as it focuses on virtually every aspect of shopping. It had a run of over 6 years in San Francisco. "Shopping! The Musical is great! Bobrow utilizes words in a truly amazing way that amuses, cajoles, and, yes, often astounds." "Virtually every nook and cranny of the consumer experience is poked, prodded and examined in Shopping! The Musical - a musical comedy revue with Tom Lehrer-style songs illuminating slices of life in the shopping universe: from the mysterious (even sinister) motives behind 'handling charges' to the secret dreams of the guy who plays piano at Nordstrom. The satire of consumer culture here is served with a good-natured grin that's more interested in you chuckling rather than inciting you to revolution. This incisive tone might be a reason Shopping! The Musical is still packing houses and cracking smiles." "If you're looking for laughs, get on down to Shopping! The Musical by Morris Bobrow. A talented group of attractive gals and guys are singing about what it's like to buy tools at Home Depot, bluy gross quantities of stuff at Costco, and otherwise help our American economy to succeed. It's a fun show for all!" "Shopping! 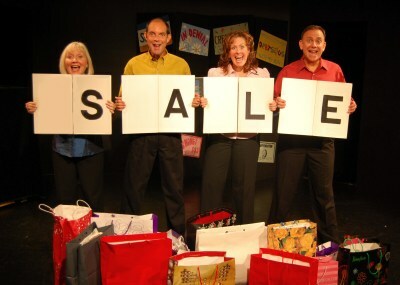 The Musical is an entertaining way to spend time delving into the 'fine are of shopping.' This fast-paced, very witty show, written by Morris Bobrow, seems particularly appealing to people who relish the art of shopping as entertainment. The lyrics of the tunes are extremely clever. The show explores the volume shopping temptations of warehouse stores such as Costco, the ease of internet shopping at 3 A.M., the loss of the beloved 5 and 10 cent store, with its luncheon counter and "sundries" and "oceans of notions." It delves into the more modern frustrations of trying to purchase something when the computers are down, as if no one knows how to do anything by hand anymore. The show has something for everyone. Shopping! The Musical is so witty and full of fun that my only regret was that it was only 80 minutes in duration."